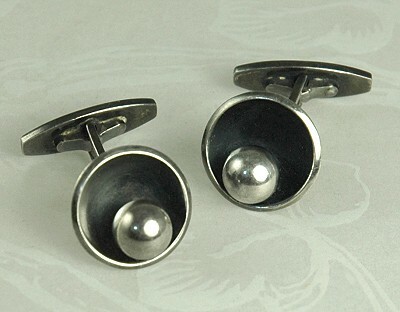 SOLD These elegant minimalist cufflinks are from Hans Hansen of Kolding, Denmark. One ball sits inside of a concentric circle. They are sterling silver and have swivel backs. Each of these sculptural links is marked with the early, pre- 1930s, double "H" the design number "610" along with "925s" and "Denmark". In the 1990s this firm became part of the Georg Jensen. Condition: Excellent vintage. The links have not been polished. Measurements: 3/8" tops.